Colchani, we drive in our 4*4 jeep from Uyuni to the town of Colchani we will visit the Salt factory where they put Iodine to the salt, everything is manual. The salt workers sell souvenirs made of salt. After this visit we continue to the biggest salt field in the world with a surface area of more than 12.000 km thin exciting Salt crust is as blinding white as the most perfect snow field, and as a gigantic mirror in the rain season. 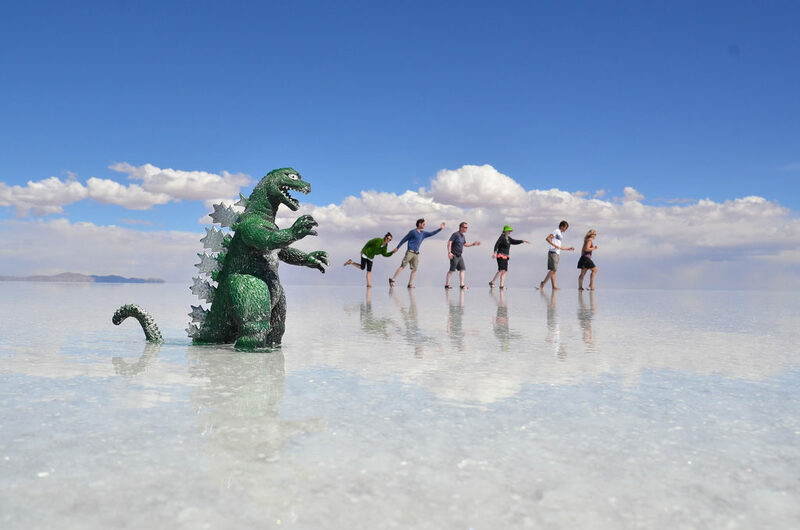 We venture across the salar of Uyuni. We drive in the middle of this immense desert of salt. It provokes a sentiment and unreality. Enjoy the jeep ride over the salt; this place is almost 1/3 of the size of Belgium. At the border of the salar we will visit the salt eyes, salt blocks and salt hotel, we arrive at the salt hotel one unusual hotel is constructed entirely of salt blocks, also chairs and tables /beds. We continue our trip to the Fish Island INCA WASI ,this is located in the middle of the salt flats at 100 km from. Uyuni, fish Island (Isla Pescado) afford views of the flats reminiscent of Polar region, dominate by blues and whites producing images of hills. Fish Island is an oasis with unique and isolated ecosystem populated by cactuses up to 8 to 10 m high. Photographers will find that fish island is one of the best sites in the world to indulge in their passion. The Island has the shape of a fish. Lunch at the island. It’s full of giant cactuses who give an extraordinary contrast with the salt. This island is an research centre and protected. 30 BOL entrée. After this visit we continue to the small village where we sleep. After breakfast, the tour will start with a trip to the Chiquini Caves and Coquesa where you will visit a cave containing pre-Incan mummies. Continue the drive uphill towards a lookout located at the base of the Thunupa Volcano where you will enjoy of incredible views of the Salt Flats. Drive back over the salt flats towards Uyuni where your tour will end. We suggest you bring .